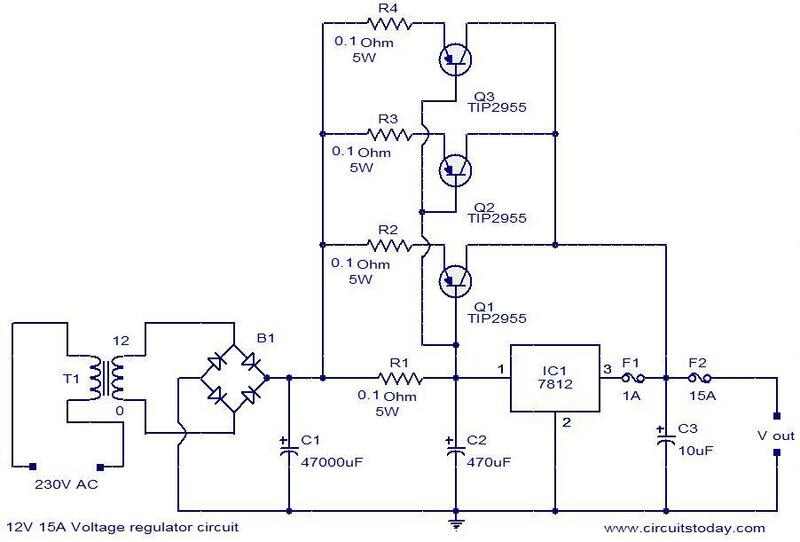 Here is the circuit diagram of a powerful 12V regulator that can deliver up to 15 A of current.The common voltage regulator IC 7812(IC1) is used to keep the voltage at steady 12V and three TIP 2599 power transistors in parallel are wired in series pass mode to boost the output current. The 7812 can provide only up to 1A and rest of the current is supplied by the series pass transistors. The 15A bridge B1 does the job of rectifying the stepped down AC input. The capacitor C1, C2 and C3 act as filters. The 1A fuse F1 protects the IC1 from over current in case if the pass transistors fail. The 15A fuse F2 protects the entire circuit (especially the pass transistors) from over current. With high current transformer, power transistors and high current bridge the circuit is a bit costly and you may try this only if there is a serious need. The T1 can be a 230V AC primary, 18V secondary, 15A type transformer. The B1 can be a 15A bridge. If 15A Bridge is not available, make one using four RURG1520CC diodes. The IC1 and transistors must be mounted on heat sinks. You can still use 2SA1943 power transistor in replacement of the TIP2955. It has a very good and high current rating. it will still work. Then you can still add rectifying diodes in series with pin 2 of the regulator to the ground so as to get 12volts to 14.9volts that some batteries require. Example is the Deep Cycle Seal Lead acid battery with a potential voltage floating of 14.9volts. that’s my contribution to the above circuit. The circuit above is very ok and simple to realize. Thanks to the designer. is it possible to bypass the transformer and diode for car use? @vimal – we are not very sure about that. You might have to try and see. by change the IC1 whith other possitive regulators (78xx) you can get other regulated voltages. not forget that choice the right capacitor voltages. in this circuit the transistors are in high bias and total current pass from IC1 because of low ohm on R1 .the R1 resistor must change from 10 ohm to 27 ohm 5w. Hi Vinay the circuit diagram is correct and it is TIP2955. PNP complimentary of TIP3055. In the above article that transistor number is TIP2599 and in the diagram it is TIP2955???? Which one is correct? I have tried up to 10 Amps. using < 500mA through 7815 and R1 as 2.2 ohms with 5 TIP2955s on the same IC's heat sink and emitter resistance of 0.22 ohms 2 watts each. Filter 5 X 4700uF 25volts. can be anything over 20,000 MFD, swap C2 with C3, and F1 isn’t needed at all. Hi, I have tried this circuit. Everytime I draw more than 1 Amp on the output, F1 blows. Is it maybe because of R1 that the transistors do not switch on?